Four full-cast audio dramas plus a behind-the-scenes documentary. Artificial Intelligence by Matt Fitton. The Pelage Project by Ian Potter. State of Emergency by Justin Richards. Written by: Paul Finch, Matt Fitton, Ian Potter and Justin Richards. Directed by: Ken Bentley. I just finished listening to this and went and purchase the other two right away. I love the different voice and stories. Another great spin-off of Doctor Who! This was well performed and written as all the big finish plays tend to be. It was great fun, seeing what the characters of remembrance of the Daleks did after that story. Just listened to all of the available series on Audible, 1-3, back-to-back. The story follows the Counter-Measures team solving mysterious events, similar to ‘The X-Files’. Based during the 1960’s, it has a period ‘The Avengers-esque’ soundscape to match. The first series is OK, but a bit of a mess in places; within the behind the scenes documentary it is acknowledged they learnt what worked and what needed changing. And am happy to say that series 2+3 are both much improved. The main issue with Counter-Measures, for me, is the delivery of one actor’s lines. So often they’re flat, lack emotion, or are poorly timed which results in them jarring with the flow of dialogue. It does improve in the latter half of series 3 so am hopefully once Audible gets Series 4 it’ll be a 5* all round review. And one last thing to say is, Hugh Ross is fantastic as Sir Toby Kinsella. He’s got a great voice. Like retro 60s sci-fi...? Give it a punt ! I had never heard of this series, but after a little background reading found out it came out of a single Dr Who episode from (I think) the late 80s. While written and broadcast from 2012, the whole thing is set in the 60s and does indeed do a good job of actually sounding like it was written and produced in that era.... except perhaps from the point of view that two women would not likely have been cast in the leading roles in this type of drama back then. Series 1 includes a set of "production notes and cast interviews" at the end, which explains a lot of the way the series came about, the feel they wanted to achieve, etc, which is interesting if you haven't heard of the series before. The 4 episodes of Series 1 are quite diverse, but all Sci-Fi-y in nature. I think my favourite is the final episode dealing with the Wilson Government of the mid-60s... I vaguely recall the resignation of Wilson when I was very young, so "sort of" identify with this, if you see what I mean. For all the blog-chat and cast interviews about similarities with Dr Who, UNIT, etc, I have to say that I found major parts of this to remind me of "Doomwatch", an early 70s BBC TV series. There are definite parallels in "The Pelage Project". The series also has an element of the "Quatermass" series (from the late 50s) about it, too. Like other reviewers (on Audible and on other internet sites) I totally agree that part of the audiobook suffer from shockingly bad audio reproduction, so much so that it sounds like some characters are behind a door in a different room delivering their lines. If this really was a 1960s production, that might be excusable, if not acceptable, but this was produced in 2012. Some put this down to the Audible version of the media... I don't know. But a "remastering" should really be considered to correct this short-coming. In spite of this, I will be getting series Two. this could have been very enjoyable except its completely overpowered by sound effects and music. its as though they let a couple of eight year olds loose in the radiophonic workshop. I had to abandon the first story as found it impossible to listen to. shame as the acting is fun. if you have resilient eardrums, go ahead. If you could sum up Counter-Measures Series 1 in three words, what would they be? I enjoyed the story but it is ruined some what by the poor sound quality that audible provides. Would you listen to Counter-Measures Series 1 again? Why? Yes, good Avengers style fun! Big Finish productions can be very mediocre and lack heart but this was actually good and I'd listen to others in the series. Some bad line readings but also some good performances. What's with the 1970 sound effects?? it was a dramatization and I could hardly hear it over the sound effects - I tried re-downloading thinking my copy was corrupt! 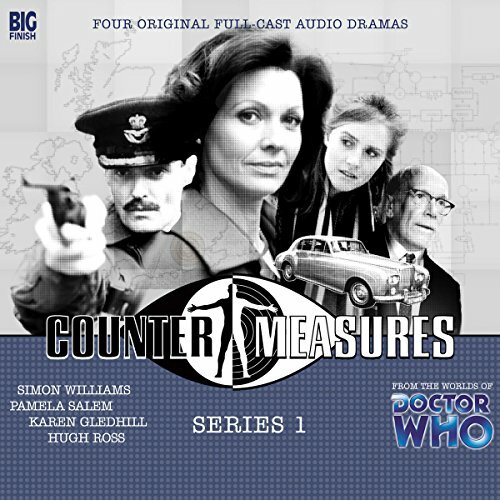 What character would you cut from Counter-Measures Series 1? Terrible - what a waste of a couple of good actors!